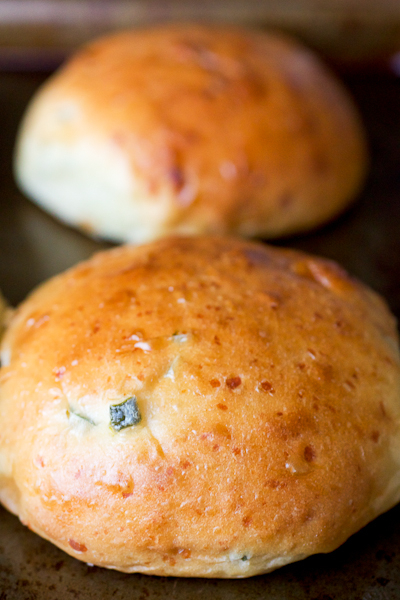 Jalapeño Cheddar Hamburger Buns + A Giveaway! As of a couple of years ago, I was a complete wuss when it came to just about any spicy food. But somehow, somewhere along the way, my tastes have changed (Kyle loves this) and I’m all about spicy foods now! If you were at our housewarming party a couple of weeks ago, you would have found me next to the antipasti platter popping hot cherry peppers stuffed with prosciutto and provolone into my mouth like they were candy. Totally addicting! When I decided to make those Tex-Mex sloppy joes sandwiches a few weeks back, I knew I wanted homemade buns. But not any ol’ bun would do! I’d had my eye on Shawnda’s jalapeño cheddar buns for months and since the buns aren’t really generalizable to the population foods you put on hamburger buns, because you know, they are made with jalapeños, I plucked this recipe as my first choice for those Tex-Mex sloppy joes. And this was the perfect choice indeed! The buns are an adapted version of these rocket rolls (which I already adore) and with the addition of sharp cheddar cheese and chopped up spicy peppers, you honestly can’t go wrong. However, if you’re not into all this flavor in your hamburger buns, I get it! Potato buns would be just right for sloppy joes or any other burger, for that matter! But! If you’re looking for a unique and incredibly delicious kitchen project, you should these jalapeño cheddar hamburger buns a shot. They are unbelievably soft and plush yet sturdy enough for a messy dinner like sloppy joes and I’ve got a few leftover in the freezer for either another round of “joes” or another idea I’ve been cooking up. Dare I say I’m excited?! Add warm water to the bowl of your mixer fitted with the paddle attachment and sprinkle the yeast over top of the water. Let sit for 5 minutes until most of the yeast has dissolved. Stir in the, oil, 1 egg, and sugar into the yeast mixture. With the mixer on low speed, mix in the flour, salt, cheese, and peppers until the dough forms a shaggy mass then switch to the dough hook. Knead on medium-low for about 2 minutes. The dough should clear the sides of the bowl; if the dough sticks, knead in additional flour by the tablespoon until the dough no longer sticks to the sides of the bowl. Increase speed to medium and knead the dough for 5 minutes. Transfer the dough to a large bowl that has been lightly greased with oil. Cover the bowl tightly with plastic wrap and let rise in a warm place until doubled in bulk, 1 to 1 ½ hours. Line a baking sheet with parchment paper. Once the dough has risen, transfer the dough to a lightly floured work surface and divide it in half. Divide each half into 4 equal pieces (or 6 if you want 12 smaller buns). Roll each piece in to a boule (ball) with any loose ends tucked under the bottom of the boule. Place each boule on the baking sheet about 1 inch apart and flatten each a little bit with your hand. Cover with a damp paper towel or kitchen towel and let them rise for 20 minutes. Preheat oven to 350° F. Allow the dough to continue to rise while the oven preheats. Whisk the remaining egg with 1 tbsp water in a small bowl and set aside. Once the oven has pre-heated, brush the tops of the buns with the egg wash and bake for 20 to 30 minutes, until golden brown. Let the buns cool on a the baking sheet (on a wire rack) for 10 minutes before slicing. Leftover buns can be stored in a well-sealed bag for 1-2 days but I recommend freezing the leftover buns within one day of making them to preserve freshness. Homemade buns have always seemed a luxury baked good that I likely wouldn’t tackle… but these, well… they’re a different story. Too much good yumness to pass up! These look so yummy. I am thinking they would be great with a pot of chili for the game! I agree! 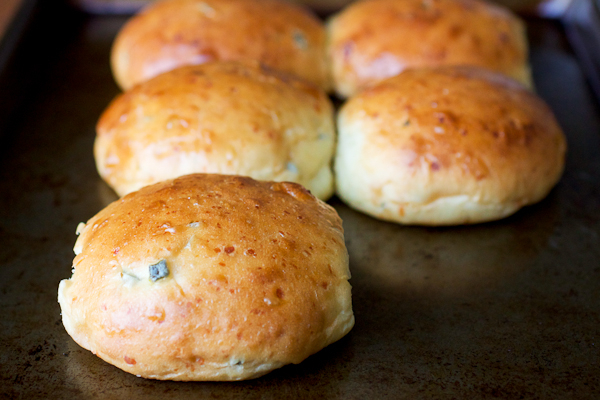 Made smaller, like dinner roll-size, these would be fantastic with chili! Yum, I have wanted to try these rolls for a burger. Need to work on that. Mmmm, these sound amazing. Can’t wait for BBQ season. Made these yesterday, so easy and tasty!! Delicious! I was looking to use up 1/2 a large jalapeño, so mine don’t have quite as much heat as they should. And since I can’t follow directions, I put both eggs into the dough! Because of this, I had to add a fair bit more flour. I’ll be making these again soon and following the directions! They’d be great with chilli, as hamburger buns, for sandwiches, or even as we just devoured them-with butter. So happy to hear how these buns turned out for you, Jennifer! And I totally agree they would be great with everything you suggested…especially the butter part. 🙂 Thank you for following along and for coming back to leave a comment! !